If you want to pull an 8,083 kg truck in your running shoes, it sure helps to have level ground. Homelessness advocate Lia Grimanis felt that firsthand on Dec. 12, her 42nd birthday, when she set a new Guinness world record for the heaviest vehicle pulled 100 feet by a woman. “You’re either being chased by the truck, or the truck becomes thousands and thousands of pounds heavier, just with the slightest incline,” she says. 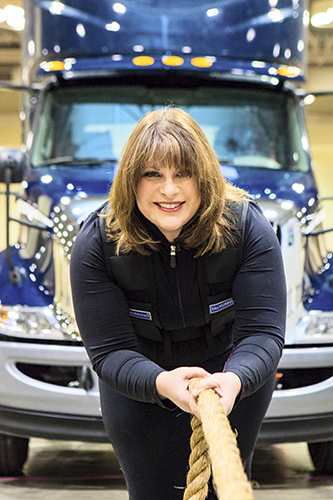 Beacher Lia Grimanis, founder of the non-profit Up With Women, pulls an 8,083 kg truck to set a new Guinness world record on Dec. 12. Grimanis, who was homeless as a teenager, started Up With Women to give high-level career coaching to formerly homeless or at-risk women in Toronto. Until Valetine’s Day, donations will be matched up to $20,000 by Maple Leaf Foods and Canada Cartage. For more information, visit www.upwithwomen.com. 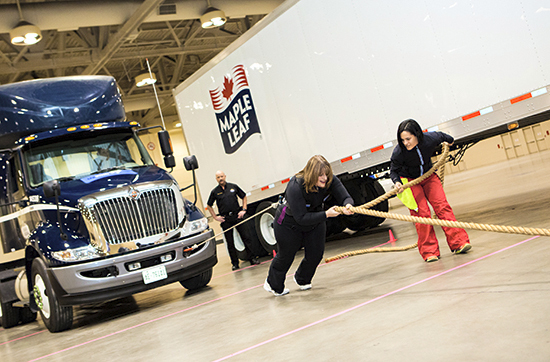 Sponsored by Maple Leaf Foods and Canada Cartage, the truck pull raised 10,000 lbs of food for YWCA Toronto shelters and up to $20,000 in matching funds for Up With Women, a non-profit Grimanis started in 2009 to help women who are homeless or at risk of being so. It is also a potent symbol for Up With Women’s particular goal – to help women pull away from homelessness and into rewarding careers. While it may seem like a Herculean task, Grimanis says she is living proof it can be done. And she is not the only one. As a teen, Grimanis faced violence at her Riverdale home. Starting at 16 years old, she ran away several times. At first, Grimanis couch-surfed with friends – a type of homelessness she said is far more dangerous than people realize. After nearly two years, things finally got so bad at home that Grimanis decided to make a complete break. She phoned an abuse hotline and got a bed at Stop 86, a YWCA shelter for young women. It meant dropping out of high school in Grade 11 and working a full-time, minimum-wage job to support herself, but Grimanis says moving to Stop 86 and then to a subsidized rooming house was the best thing that ever happened to her. From then on, she had a locked door, a secure address and 24-hour access to crisis counselling. She found out she was eligible for welfare. But one thing Grimanis never got was a clear sign she could climb out of poverty and succeed. Today, Up With Women offers the sort of thing Grimanis was looking for at 19 – a year-long program that pairs formerly homeless or at-risk women with career coaches who guide the way to something beyond a survival job. So far, success stories include that of Iman, a woman who enrolled in an aesthetics school and plans to open her own spa. Another woman, Esther, finished her nursing studies while living in a shelter and running a part-time financial services business. In her own case, Grimanis did not have a career coach, but she did decide early on that with no high school diploma, her best bet was to become an entrepreneur. She started by running a rickshaw, then running her own rickshaw company. It took years, but that hands-on experience eventually landed her a six-figure salaried job in software sales. Fifteen years later, Grimanis was among the top salespeople at SAS Canada. But only friends and family knew she had been homeless, and Grimanis badly wanted to speak out and give other young women a chance to rebuild their lives faster than she had be able to. “It was such a scary thing because I knew that once I finally came out, it would be yesterday’s news after that,” she said. Grimanis first told her story on CHFI FM, during the morning drive show. But it was at a much smaller venue, a public meeting at the Balmy Beach Club, where Grimanis had the homeless coming-out that led to Up With Women. It was December of 2006, and some of her neighbours in the Beach were opposing plans by St. Aidan’s church to run a once-a-week homeless shelter as part of Out of the Cold, a winter shelter program that is now co-hosted by 16 houses of worship in Toronto. Grimanis got several fliers about the issue. Some asked reasonable questions, she said. Grimanis decided to go to the meeting and speak up. Grimanis stood up and told her neighbours she had the same stake in the street – she had invested a lot of money to live in the Beach. But she had also been homeless, she said, and survived thanks to a shelter. She asked everyone to remember her before they turned others away. After she spoke, one man thanked her for sharing, but challenged her, saying she was an anomaly. In popular culture, Grimanis said there are already a few stories like hers. Pursuit of Happyness, a book by Chris Gardner, a homeless single dad turned stockbroker, was made into a Will Smith film. When All You Have is Hope tells the story of Frank O’Dea, who was homeless in Toronto when he co-founded Second Cup. Such rags to riches stories do grab headlines, Grimanis said. But they can be a double-edged sword, given that their success is so extraordinary. At a recent TED X talk, Grimanis showed a photo montage of women she has met – well-dressed and smiling, they stand out only when Grimanis points out those who were formerly homeless. Grimanis is fundraising so she can expand the Up With Women program to cities beyond Toronto, and take in more people like Iman and Esther.